Water level logger is a simple but precision equipment to monitor the level of water, record it and document the data on regular and continuous basis. It helps to control both groundwater and surface watercourse. Actually, you can monitor the level of any liquid in any reservoir, but you have to remember that it has to be homogeneous and not harmful to the materials the logger is made of. The principle of operation is uncomplicated but accurate and gives reliably correct results. To calculate water level the measuring device uses the pressure of water on its pressure sensor. Monitoring and control of refilling of water resources, and many others. 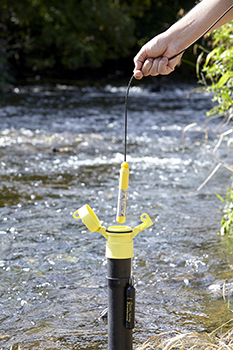 While calculating water level logger compensates the changes in atmospheric pressure, and the way they do it divides them into two main types – vented and non-vented loggers. The vented variant goes with a tube that helps to equalize the pressure on both sides of the sensor. Well-constructed, supplied and served vented water level loggers give very accurate information about the reviewed object, but they have some disadvantages too. First of all, they are bigger and unhandy, and they need additional maintenance. You need to control the contamination of the vent tube, and the level of condensate in it, as it can cause the irregular and invalid documentation of data. Non-vented loggers take the information about the atmospheric pressure from the barometer loggers or meteorological stations, and use mathematical formulas programmed in their electronics to measure the water level. Barometric loggers and level loggers often go in package and you easily synchronize them. If the level logger reads the data from weather stations, they can be up to 10 miles away from the object, depending on the model of your device. Non-vented models are handier than their vented counterparts, easier to move from one researched area to another, they do not need any additional service. There are few things good to know during continuous monitoring of your well or water reservoir with the help of water level logger. Both variants of devices are provided with built-in electronics, which automatically archives and reports the measurements. Long-time battery and solid durable materials let you leave this instrument unsupervised for a long time. Loggers can operate autonomously and independently, gathering data in programmed timetable. You can offload the information when you need, some models can set wireless connection directly with your mobile device. The loggers go with the software to install to a computer or smartphone, which gives you the detailed information in diagrams or regular notes.